Tag Archive | "College Gear"
Rather than shelling out money for Microsoft Word or Excel, Google Docs is a free program that you can access from your mobile device or computer. Google Docs lets you create a new document, or work on another one that was started on by someone else. One of Google Docs’ coolest perks is its collaboration feature that lets you invite others to see what you are doing. For example, if you are working on a group project for Psychology 101, you can share your work and confer with your classmates on a document at the same time—all from different locations. Everyone will have their own unique cursor in the document so you can watch as they type in additions and edits to the project, and you will all have access to the latest version of your work. Since Google Docs automatically saves things as you go, you won’t ever experience that sinking feeling that comes with lost work. Google Docs also features some nifty editing and styling tools including images, tables, and thousands of fonts. If you are looking for an easy-to-use and free cloud-based storage system, you can’t go wrong with Dropbox. 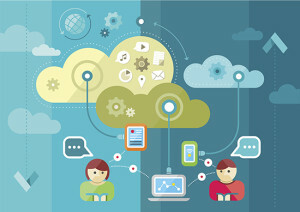 Dropbox gives you access to your school work and other files from any computer or mobile device, and it comes with 2GB of free space. Instead of emailing yourself important term papers that you are working on—and running the risk of your work being lost in cyberspace—you can instantly find your files. Dropbox is limited on storage space, however, so if you find that you need more storage space, choose a different cloud service provider that offers a larger amount. Compare providers at Top10CloudStorage.com, a site featuring in-depth reviews and pricing info on 10 reliable cloud storage services. Pixlr is a free cloud-based online program that includes plenty of tools, photo editors and photo sharing abilities. Pixlr can transform your computer, smartphone, or tablet into a mean, lean photo editing machine. Once you download the Pixlr program, you can transform your photos into works of art by cropping, rotating, and adding in borders and overlays. Once you create your free account, additional premium content will become available; this includes Auto Contrast and Double Exposure features. It will also help you create a professional looking photo collage with proper spacing and backgrounds, and if your photo is dark or washed out, the Auto Fix feature will improve the colors. The program also allows you to channel your inner artist by transforming your selfies into pictures that look like watercolors or pencil drawings. It even allows you to remove that alien “red eye” look that is common in photos. When you are finished editing your photos, they can easily be shared on social media sites. What do Ramen Noodles, care packages and free events have in common? 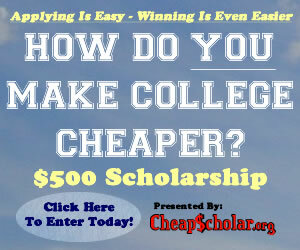 They’re all very appealing to college students, particularly those who are financially strapped. And for those who are fashion savvy, affordable apparel is equally important. But after tuition, fees, books and living expenses are paid, there’s little left for shopping. Protect your eyes from the sun’s harmful rays as you walk to class with a stylish pair of sunglasses like Oakley or Ray Ban. After you invest in a quality pair, you can maintain them by changing out scratched lenses from a reputable online retailer that offers replacement lenses, such as Revant Optics, instead of buying a new pair. Who said you had to have an abundant collection of tops and bottoms to be stylish? Money’s tight, and so is dorm closet space, so the idea here is to keep it simple with your selection so it’s much easier to mix-and-match garments. Instead of purchasing those colorful or funky patterned jeans, go for traditional blue denim. Sounds boring, but you’ll have many more outfits to choose from as they work well with either casual and fancy tops or sweaters. Speaking of which, stay away from items that are poorly made, like thin tops, sweaters that can be picked apart easily or cheap jeans. Reasoning: after a few trips to the washer and dryer, you can kiss those pieces goodbye! Ladies, don’t forget to get your hands on a little black dress for formal events. Not only does it complement your figure, but it can be worn on several occasions. All you have to do is switch up the accessories. Gentlemen, stick with dark-colored suits and solid shirts. You can always swap out jackets and ties to create a completely different look. It’s not necessary to dress like you’re heading to a job interview, but it helps to be presentable enough to be perceived in a positive light and respected y others, including your professor. The last thing you want to be known as is the sleep walker who proudly parades around campus in his or her pajamas. By doing the latter, you could miss out on a career opportunity (since you never know who’s watching) or even worse, meeting the man or woman of your dreams. Cover it up. Extremely tight fitting or baggy clothing that expose your personal assets should be avoided. Upgrade your shoe game. Flip-flops are cheap, but not very stylish. Pop your collar, well not literally. Ditch the worn tee for a collared shirt. Unless you’re getting the deal of a lifetime, steer clear of designer labels. While the garments and handbags may catch your eye, there are several other cost-efficient alternatives that will get the job done. Last but not least, don’t forget to stick to your guns while shopping. If you only have $30, make a list of what you’re looking for, check it twice and leave the bank and credit cards at home. And if the items you’re considering aren’t flexible or exceed your budget, kindly place them back on the rack and move on. A carpet skirt is a great addition to any college winter wardrobe, claims The Refinery. Unlike more formal and often itchy wool skirts, the carpet skirt features bold prints and is usually made with a more comfortable blend of cotton and polyester. They aren’t terribly expensive either; Topshop sells a Kirada Jacquard Midi Carpet Skirt for just under $100. This skirt can be worn for many occasions from class to an intern interview, making it well worth the money. One of the great things about skinny jeans is that they look great on all body types and sizes. They also work well with a variety of tops, allowing you to keep your own personal style with the staple piece. Furthermore, skinny jeans can be dressed up with a nice shirt and some accessories for holiday meals with grandma, or they can be paired with a long sleeved T-shirt for grabbing pizza with friends. Skinny jeans also are easy on the budget – American Eagle Outfitters sells a variety of dark rinse skinny jeans for men and women for less than $40. For college students who wear contact lenses, it can be fun to mix it up a bit during the winter months with color contact lenses. This can easily add some oomph to your winter fashion choices and give you the change you’re looking for. This change also can bring more attention to your eyes and face, so try changing up your makeup routine to match the new color. Vision Direct stocks colored contact lenses in hues like Brilliant Blue or Gemstone Green – the blue contacts can complement the icy winter and the green can match your holiday decorations. Sweatshirts are not just for the gym or lounging at home. In fact, many retailers sell sweatshirts that are nice enough to layer with casual and dressy outfits. LL Bean sells attractive and budget-friendly sweatshirts for both men and women. And the best part is how comfortable you will be these crewneck ultrasoft sweats for women are made of French terry that is super smooth on the outside and soft on the inside. The sweatshirt also features a more feminine cut, which means it can easily be paired with skinny jeans and a nice scarf or necklace to complete a cute, comfortable look. No matter what winter staples you purchase this winter, be sure they can be worn multiple ways in multiple settings. 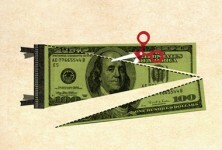 This will help you save money and vary your look with minimal effort. Happy shopping! College is expensive. The tuition is bad enough—you haven’t even considered all of your tech related expenses. You go to class, and everybody there has an iPad, tablet or laptop and you have seventeen boxes of number two pencils because that’s all you can afford. While that last part might not be true, tech-outfitted classrooms aren’t rare. Here are three gadgets that will help you keep up. You can’t get a laptop, tablet or iPad because they’re too expensive, and you don’t want to take on a third job. So who needs one? Just use your phone. With the Celluon Epic* you can turn your favorite device into a laptop. Just flip the switch, pair it with your phone (or any of your devices) via Bluetooth, and you’re good to go. The Epic* is a small device (seven ounces, two inches tall) that you can sit on any flat surface, and it will laser-project a virtual full-sized keyboard onto that surface. It has a mouse feature that tracks your finger’s movements; with certain gestures you can right-click, zoom in and out, and go forward or backward. Toss your notebooks and binders, and simplify your note taking with some help from your smartphone. The Samsung Galaxy Note 3 (equipped with a 5.7-inch HD screen) is perfect for students because it features an innovative note taking platform. Use a stylus or S Pen to take notes, during lecture or use Action Memo to write down your to-do list. This tool can even convert what you write into an email or text with the “link to action” feature. This tool will be crucial during your first few weeks at college. Between meeting new people, learning about clubs and organizations, or rushing a fraternity or sorority, this tool can help you keep connected and take notes on the fly. College students don’t just go to class and back to their dorm room—they go everywhere. The library for study sessions, the student union to grab a bite to eat and then it’s off to that job. And you can’t bet on the assumption that these places are going to have charging stations or power supply available. In today’s technology driven world, where lectures are hosted online, e-books are read, and course communication is accessed on the Web—when you go to campus you have lug around all of your tech stuff and that backpack can get heavy, fast. Ditch your chargers and cut some of the weight of your backpack by investing in a wearable portable solar charger, like a backpack. The SolarGoPack is not just a backpack, it’s also a charger for all your devices. It has a detachable solar panel on the outside surface so that you can charge your devices using the sun as your power source. In direct sunlight it takes three hours to charge the lithium ion battery. When it’s fully charged, it can charge your phone in less than a half an hour. It comes with an eight piece charging kit so that you can charge multiple devices too. These days, back-to-school sales are more likely to feature discounted tablets than discounted No. 2 pencils. That’s good considering that high school and college students in particular will probably fill their brand new backpacks with more gadgets and fewer books. It adds up and can even become a real budget buster when different professors have different technology requirements. From their point of view it makes sense. According to one Pew Research Center survey, a majority of teachers think that tech in the classroom and at home can make students better researchers and more independent learners. But when you’re the one shelling out the cash for a school supplies list a mile long, you need to make smart decisions. College students already spend about $1,200 on books and supplies each year according to the College Board. Lucky for you it doesn’t take a Master’s Degree to find the gadgets that are as useful as they are affordable. 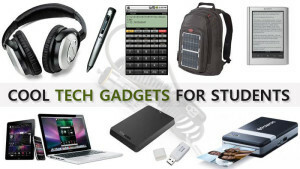 Here are some top pics for affordable student tech gear that will take you from now until graduation day. 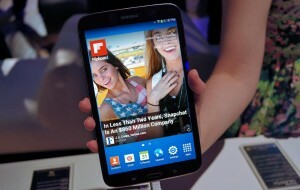 Try the Galaxy Tab 3 from Samsung. You get a powerful multimedia device that fits in your hand and the smaller phablet version rings in at under $150 when you shop around. Besides free 50 GB worth of Dropbox Storage, there are other ways to save. Carrier T-Mobile offers some free 4G LTE data for tablet customers and has affordable rate plans that are perfect for college students. 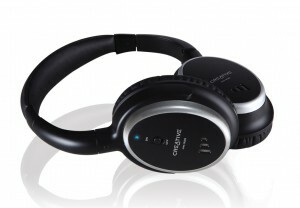 For under $60 you can snag Creative HN-900 noise cancellation headphones that will make studying that much easier thanks to decent noise cancellation and good balance. The best part – beside the student-friendly price tag – is that the thing most likely to break on over-the-ear headphones (the cable) is detachable so you can replace it without having to spring for new cans. Great backpacks don’t come cheap anyway so spend a little extra for one that does more than just hold books. 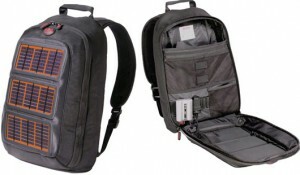 The Voltaic Converter Solar Backpack will run you about $150 but will save you endless headaches thanks to its ability to charge phones, tablets, cameras, and other gadgets. 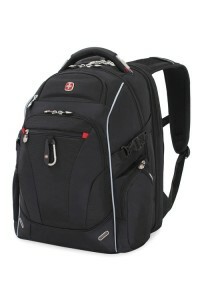 It’s also light, waterproof and built to handle college life. Plus it’s an easy way to make your walk to class feel more productive. Make that a very portable keyboard. 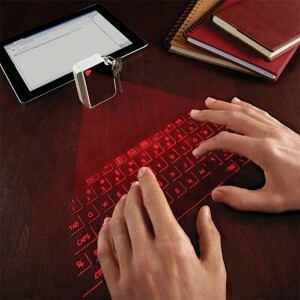 The Cube Laser Virtual Keyboard connects wirelessly to laptops and most mobile devices to broadcast a full QWERTY layout that projects onto any flat surface. It is also small enough to stash in your pants pocket, which is why at about $99 it wins out over less expensive roll up keyboards and more expensive iPad case and keyboard combos. Not the kind of backup plan that you turn to when you can’t hack it in your major but rather the kind you turn to when your laptop dies a hideous death. The WD My Passport 1TB portable external hard drive will set you back $60 but remember that the comfort of knowing your dissertation will still be there no matter what is priceless. 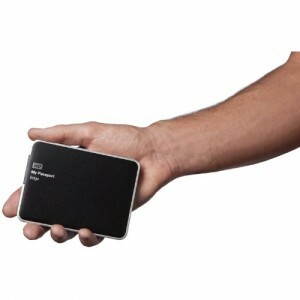 It’s ultra compact, you can password lock it and it even automatically backs up software. Still recording lectures while you take notes (or not)? Why not do both? 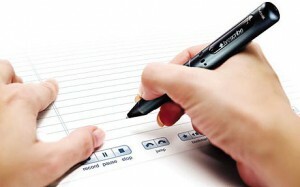 Livescribe’s Echo smartpen automatically records everything you hear or say while you’re writing on Livescribe’s paper. Tap your notes to replay the audio, send your notes to a mobile device, social profile or app, and never miss another word of the most essential courses in your discipline. So, there you have it! These affordable tech gadgets are for sure going to be a hit in the hallways this year at campuses around the world. Do you have a favorite gadget that you can’t live without? Today’s guest article comes from Jessica Oaks. She is a freelance journalist who loves covering technology news and the ways that technology can make life easier. Follow her on Twitter @TechyJessy.